St. Louis Bay and Shieldsboro Harbor Mississippi. 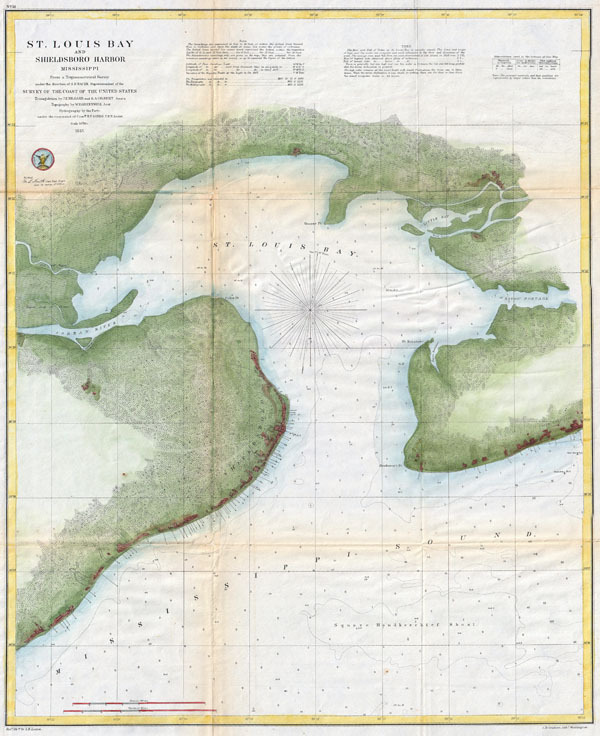 An attractive hand colored 187 U.S. Coast Survey triangulation chart or map of St. Louis Bay, Mississippi. Details the area around St Louis Bay including the town of Shieldsboro (modern St. Louis Bay) and Pass Christian, Mississippi. Details to the level of individual buildings showing many of the wharves and piers in both communities. Shows the Jordan River as well as the Bayou Portage. Square Handkerchief Shoal is noted. Depth soundings throughout. The hand color work on this beautiful map is exceptionally well done. The triangulation for this map was completed by J. E. Hilgard and S. A. Gilbert. The topography was accomplished by W. Greenwell. The hydrography is the work of a party under the command of B. F. Sands. This map was compiled under the direction of A. D. Bache, Superintendent of the Survey of the Coast of the United States and one of the most influential American cartographers of the 19th century. Very good condition. Original fold lines exhibit minor toning and wear - especially at fold interesections. Minor verso restoration and reinforcement. Minor publishing wrinkle in the upper right quadrant.